Original Editors - Stephanie Gloyeske from Bellarmine University's Pathophysiology of Complex Patient Problems project. Alcoholism is a serious disease where people have an overpowering desire for the physical and mental effects of drinking alcoholic beverages. The formal term for this type of abuse is alcohol dependence and is the most severe type of alcohol problem. Alcohol is the most dominant addictive agent in the United States. It can be identified by four main symptoms: craving, loss of control, physical dependence and tolerance. Alcoholism is the most common drug abuse problem in the US, affecting more than 15 million Americans, including the adolescent and aging populations. The National Institute of Alcohol Abuse and Alcoholism reports that alcoholism affects 1 in every 12 adults in the United States and men typically more than women. They go on to say that alcohol problems are highest among young adults ages 18-29 and lowest among adults 65 and older. It has also be reported that the earlier an individual starts drinking (14 or younger) the more likely they will develop alcohol related problems. 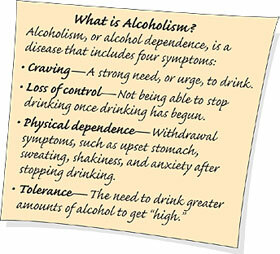 Co-morbodities associated with alcoholism are usually psychological in nature. 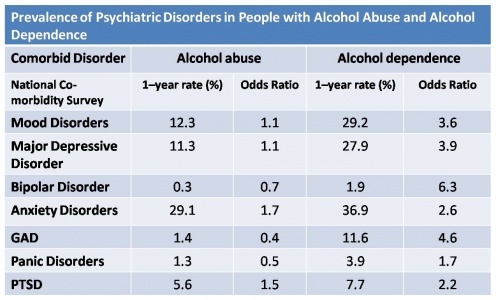 The following table shows the prevalance of different psychological disorders than have gone along with alcoholism. The odds ratio represents the increased chance that someone with alcohol abuse or dependence will have the co-morbid psychiatric disorder. From looking at the table, a person with alcohol depencence is 3.6 times more likely to also have a mood disorder compared to a person without alcohol dependence. Alcoholism is diagnosed through several screening tools. There are several tools that can be used to asses an individuals history of alcohol use, including the Short Michigan Alcoholism Screening Test (SMAST), the CAGE quesitonnaire, and the Alcohol Use Disorders Identification Test (AUDIT). The SMAST is a 13 item questionnaire that can be completed within minutes by answering "yes" or "no." The test is self-administered. A score of 1-2 indicates no problem, a score of 3 indicates a borderline alcohol problem, and a score of 4 indicates an alcohol problem. The CAGE questionnaire is a four question survey used to identify the potential for an alcoholic problem. The AUDIT is designed as a brief, structured interview or self-report survey that can easily be incorporated into a general health interview, lifestyle questionnaire, or medical history. It is 10 questions that are based on the amount and frequency of drinking, alcohol dependence, and problems caused by alcohol. It is often dificult to screen for alcohol abuse because some signs & symptoms (falling, memory loss) which may be associated with aging or people may complain about digestive problems, pain or weakness but never reveal alcohol abuse. Denial is a hallmark sign. Excessive alcohol use can cause or contribute to many medical conditions. It is extremely toxic and harmful to tissues of the body. Alcohol has a vasodilatory and depressant effects, which may produce fatigue and mental depression or alter the individuals perception of pain or symptoms. The different systems that alcohol may affect are the gastrointestional, hepatic, cardiovascular, hematopoietic, and neuromuscular systems. Prolonged use of excessive alcohol may affect the metabolism, resulting in reduced bone formation, disruption of hte balance between bone formaiton and resorption, and incomplete mineralization. They are also malnourished, which increases the effects alcohol has on bones. Alcohol affects the central nervous system as a depressant. The liver breaks down alcohol so it can be eliminated. If more alcohol is consumed than can be processed, the imbalance injures the liver by interfering with the normal breakdown of proteins, fats, and carbohydrates. There are three types of liver disease which are related to alcohol consumptioin. The first is fatty liver, which is marked by a build up of fat cells. It will improve when the individual stops drinking. The second is alcoholic hepatitis, which is an inflammation of the liver. The damage may be reversible if drinking is stopped, but in its most severe form may be life threatening. The third is alcoholic cirrhosis (pictured below) and the most serious. Cirrhosis refers to the replacement of normal liver cells with scar tissue. The damage cannot be reversed and is life threatening. The kidneys play a role in fluid regulation of the body as well as the production of hormones that regulates blood pressure, red cell prodection, and calcium metabolism. Alcohol directly effects kidney function by altering the form and structure of the organs. The basement of the glomerulus becomes abnormally thick and is caused by cell proliferation. Further changes include enlarged and altered cells in tubules. The kidney may also swell. The heart is an important organ. Heavy consumption, over time, can lead to high blood pressure, alcoholic cardiomyopathy (enlarged and weakened heart - seen in the picture below), congestive heart failure, as well as stroke. Drinking also puts more fat into circulation raising the triglyceride levels. The pancreas serves two major functions - production of insulin and glucagon and the secretion of enzymes that aid in digestion. Alcohol consumption can cause pancreatitis, an inflammation of the pancreas, that can cause problems with digestion. When is it that you feel you need these substances? How do these activities help you? Are you concerned about your dependence? Do you have a pattern of cutting back or stopping the use of alcohol, but then restarting it? Have you been concerned or has anyone around you raised concern about your use of alcohol? If an individual reports the use of alcohol, the therapist should ask whether the person has discussed it with their physician or other health care personnel. The individual should be encouraged to seek medical attention or that it will be addressed as part of the medical problem with the physician. To diagnose alcohol abuse, the physician must rule out medical problems that cause symptoms similar to that of intoxicitation and withdrawl. Anyone of these conditions may cause an individual to be disoriented, unable to hold a conversation, has a short attention span, or have trouble walking or maintaining balance. One should also rule out depression and anxiety disorders.